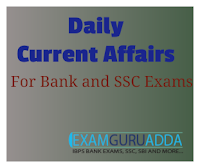 Dear Readers, we are presenting Daily Current Affairs for All Exams- 29th November 2016. 1. Argentina won its maiden Davis Cup title after defeating Croatia in the final. 2. In the final match, Argentina’s Federico Delbonis defeated Ivo Karlovic 6-3, 6-4, 6-2 to give Argentina its first title. 3. As of 2016, the Argentina Davis Cup team has competed in the World Group since 2002 and reached the finals five times (1981, 2006, 2008, 2011 and 2016). At present, Argentina is Number 1 on the Davis Cup ranking by the International Tennis Federation (ITF). 1. The Reserve Bank of India (RBI) on 28 November 2016 relaxed the cash withdrawal limit from the bank accounts with an aim to spur the deposits. 2. The depositors, who have made the deposits in the current legal tender notes, can now withdraw that amount over and above the weekly limit of Rs 24000. 3. This move comes as a relief for certain depositors who were hesitating to deposit their monies into bank accounts due to the current limits on cash withdrawals from accounts. 4. The withdrawals will be available in higher denominations bank notes of Rs 2000 and Rs 500. The move will also encourage small businesses and shopkeepers to deposit cash in legal tender which they can withdraw at the same point of time. 1. Lt-General A K Bhatt was on 28 November 2016 appointed as the Director-General of Military Operations (DGMO). 2. Lt-Gen Bhatt will succeed Lt-General Ranbir Singh, who declared at a press briefing that Army Special Forces had conducted surgical strikes against terror launch pads in Pakistan-occupied-Kashmir on 29 September 2016. 1. Akodara village in Sabarkantha district of Gujarat recently has earned the title of becoming first digital village in India. 2. The village, which sustains a total population of 1191 people, uses various cashless systems for payments of goods and services. All transactions in the village are carried out through digital modes like net-banking, SMS or debit cards. 1. An aeroplane carrying 81 people on board including Brazilian first division soccer team crashed on its way to Medellin's international airport. The Brazilian soccer team was travelling to Colombia for a regional tournament final. 2. The cause of the incident is yet to be ascertained.As per reports, about 25 bodies have been recovered from the site of the air crash, while five people were rescued alive. Three players are among the five survivors. 1. Iranian film “Daughter” has won the coveted Golden Peacock award at the 47th International Film Festival of India (IFFI). It has been directed by Reza Mirkarimi. 2. It is a family drama set in southern Iran. It brings out intergenerational conflict between a strict father and a young daughter. Union Minister for Information and Broadcasting Rajyavardhan Singh Rathore conferred these awards during the concluding ceremony of IFFI held in Goa. 1. The Union Government has decided to constitute a sub-committee of Chief Ministers of five states in the wake of demonetisation of Rs 500 and Rs 1,000 denomination notes. 2. The committee will be headed by Andhra Pradesh CM N Chandrababu Naidu. It will suggest measures to normalise the situation. Union Finance Minister Arun Jaitley has called up Bihar CM Nitish Kumar, Karnataka CM Siddharamaiah, Assam CM Sarbananda Sonowal and Maharashtra CM Devendra Fadnavis to be part of the committee. 3. Since demonetisation of Rs 500 and Rs 1,000 denomination notes was announced by the Union Government, Andhra Pradesh CM N Chandrababu Naidu government has been effectively tackling the cash crisis in the state. 1. The World Health Organisation (WHO) has dropped the term ‘counterfeit’ and retained ‘falsified’ to describe medicines of inferior quality. 2. This decision was taken by a WHO’s technical working group on draft working definitions of substandard/spurious /falsely-labelled/falsified/counterfeit (SSFFC) medical products. It settles longstanding India, EU medicine dispute and battle about labelling of drugs. It is considered as a significant victory for the global access to medicines campaign. 1. India hosted the golden jubilee (50th anniversary) celebrations of United Nations Commission on International Trade Law (UNCITRAL) in New Delhi. 2. The opening address at international conference of the golden jubilee celebrations of UNCITRAL was given by President Pranab Mukherjee.